When I was growing up, my father, like most dads of that era, declared himself the King of the Grill. He had one of those silly aprons stating this prowess. The only problem was that he had no clue how to barbecue correctly. Everything was overcooked; the chicken in particular was tough as leather and always charred black on the outside. Of course we didn’t know any better and thought everything was delicious. He had always used a formula that never varied regardless of the size of the pieces of chicken. He cooked the cut up chicken 20 minutes, flipped it, cooked another 20 minutes, basted it with BBQ sauce, flipped again and cooked another 10 minutes, and basted the second side and cooked it another 10 minutes. A total of a full hour for cut up chicken! He always worked over a very hot fire and never used indirect heat. He started grilling too soon, before the coals were covered with ash, put the sauce on too early which caused the flames to flare up, and squirted the flames with water. Based on today’s understanding of proper grilling techniques he did just about everything wrong. The thing was, everyone grilled in a similar way. But as I got older and ate at other people’s homes and in better restaurants, I realized that grilled chicken didn’t need to be tough, that it actually could be moist and tender. I learned how to judge doneness by pressing to see how firm the meat was rather than cutting into it. I discovered the beauty of brining and dry rubs in addition to regular sauces and the depth of flavor they can bring to grilled items in particular. I had a chance to show my father what properly cooked poultry tasted like one night when he came to visit me in my apartment. I grilled a half turkey breast and it came of the heat succulent, with a nice caramelization and crispy skin – and not a hint of charring. He was astonished and asked how long I had cooked it. When I explained that I went more by feel than timing, he was shocked. It had never occurred to him that there was any other way to prepare barbecued foods. Remember when you are grilling to let the fire die down a bit before starting to cook. Always clean and oil the grate to help with sticking. 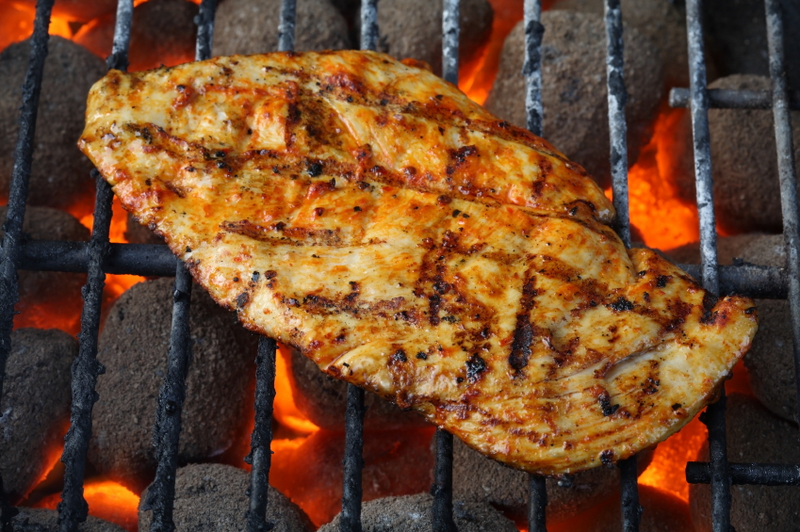 If you are using an oil-based marinade, you will get flare ups, but don’t use a squirt bottle to extinguish them. Instead, cover the grill with the lid and adjust the air holes if necessary to reduce the amount of oxygen getting to the fire. And place the meat “presentation side” down first which gives the best grill marks. For a perfect diamond shape, place all your pieces facing the 10 o’clock position then switch them all to face the 2 o’clock position. Voila! Everyone will call you a BBQ master! Today’s recipes are from a wonderful cookbook from Williams-Sonoma called Grill Master. The author, Fred Thompson, is a writer, cooking instructor, food stylist, and grilling guru. He has written several cookbooks including Barbecue Nation and Grillin’ with Gas, and writes for numerous food-related publications. The book covers a wide variety of grilling techniques and foods, with a large section on rubs, marinades, sauces, and mops which you can mix and match to your hearts content. He explains indirect and direct cooking methods, utilizing the incredible photographs of Ray Kachatorian to make sure we understand every nuance. For each recipe he suggests side dishes that go well together and there is a healthy section dedicated to “other stuff.” Here he explains how to grill perfect vegetables, fruits, breads, and pizzas. For those who are beginners, he lists all the equipment you need and how to use them. He goes through the various types of fuels and the flavors they impart as well as detailed explanation of smoking meats and food safety. This book covers all different kinds of cuisines beyond just American. You can learn what makes something taste Asian, Greek, Cuban, or North African. If you know someone who is fascinated by grilling and wants a true go-to guide, I highly recommend this book. Fred writes a detailed “game plan” for each recipe so you know exactly what to expect at each step of the way. There are so many things to love about this book, but I think my favorite is a little card tucked into a sleeve on the inside of the back cover; a cheat sheet for gas vs. charcoal grilling and on the other side a chart of cooking temperatures. It is laminated so even if you get sauce on it, it will wipe right off. This is a very thoughtful and helpful item that I have never seen done in this manner before. I chose two basic recipes for grilled chicken. The first is classic BBQ chicken using cut up pieces, brining, and a traditional BBQ sauce. The second teaches us how to grill a whole chicken and uses a “mop” sauce. While most people will stick to the customary sauce, I urge you to push the envelope and try something a little different. I have also included recipes for some alternative flavor profiles. You can choose from a North African dry rub, Rosemary-Lemon marinade, or Teriyaki sauce so there is something for everyone. With the Fourth of July coming up this weekend and everyone firing up their grills, give these recipes a shot and make sure you come back and tell us all how they turned out! Happy grilling everyone! Classic barbecued chicken doesn’t begin with boneless, skinless chicken breasts. You have to have bones to develop great flavor. Nor do you want your chicken to be burnt on the outside and raw on the inside, which is what happens to too many cooks. Here is how to fix those problems and more. 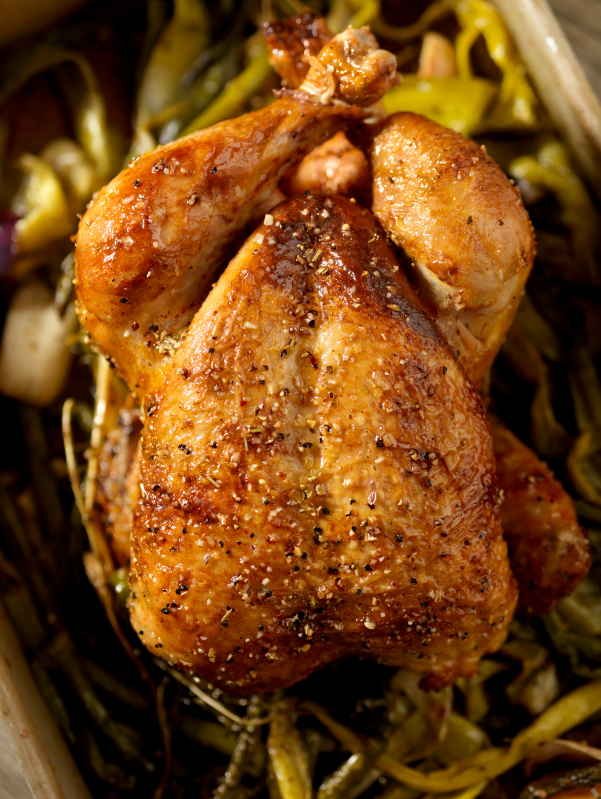 Brine the Bird: Brining adds some flavor, but more importantly, it ensures a moist result. It also makes the timing a little less fussy. If you get distracted and the chicken pieces stay on the grill 5 minutes too long, it’s no big deal. Pat it Dry: Don’t forget this step before you throw the chicken on the grill. Patting the pieces dry with paper towels helps the surface caramelize, which is the slight charring that takes place once the meat hits the heat. If the surface is moist from a brine or marinade, it will steam rather than sear, and you’ll miss out on that tasty caramelization. Use Two Heat Levels: The chicken gets a quick sear over direct heat, but most of the grilling is done over indirect heat. That lower heat helps to develop an intense barbecue flavor. Sauce it Up: Using indirect heat allows you to brush the BBQ sauce on the chicken earlier without fear of the sauce burning. That extra brushing time means you’ll end up with more of the signature tangy flavor of good barbecue. Sitting down to a whole roasted chicken is popular nowadays. Indeed, there is hardly a supermarket in the country that doesn’t sell rotisserie-roasted chickens. But cooking a bird at home is simple and less expensive, plus you get a flavor bonus when you cook it on a grill. Buy a Good-Quality Bird: But a chicken, preferably free range or organic, that weighs at least 4 lb but is not much bigger than 5 lb. Season and Truss the Chicken: Remove the giblets and neck from the cavity, and pat the chicken dry with paper towels. Liberally season inside and out with salt and pepper, add other seasoning to the cavity – usually herb sprigs – and tie the legs together with kitchen string. The trussing helps the bird to cook more evenly. Plan for a Crisp Skin: If you have time, season and truss the bird, then wrap loosely in damp paper towels and refrigerate overnight. This will dry the chicken out a bit, which contributes to a crisp skin. Go the Indirect Route: Indirect heat is the only way to go, whether the bird is on the grate or on a spit. Baste with an Herb “Mop”: Baste the chicken every 15 minutes or so to add bodacious flavor and to keep the chicken moist. For crisp skin, stop basting for the last 15 minutes of cooking. Give It a Rest: Let the chicken rest for 10 minutes or so before cutting it into serving pieces. From Williams-Sonoma Grill Master by Fred Thompson. Make the Brine: In a large bowl, combine 8 cups water, the salt, basil, coriander, peppercorns, mustard seeds, granulated garlic, and bay leaves and stir until the salt dissolves. Use right away. Put the chicken pieces in a large zip-top plastic bag and pour in the brine. Seal the bag closed, squish the brine around the chicken, and refrigerate overnight. At least 30 minutes before you plan to begin grilling remove the chicken from the plastic bag and discard the brine. Rinse the chicken pieces briefly and pat dry with paper towels. Lightly sprinkle on all sides with the pepper and granulated garlic. Make the BBQ Sauce: In a saucepan over medium heat, combine the ketchup, mustard, vinegar, sugar, broth, a pinch of salt, and 2 tsp pepper and bring to a simmer, stirring to dissolve the sugar. For a Southwest-style sauce, stir in the chiles and cumin. Simmer for 5 minutes for a relatively thin sauce or for 10 to 15 minutes for a thick sauce. Taste and adjust the seasonings with salt. Use right away or let cool and store in an airtight container in the refrigerator for up to 1 month. Prepare the Chicken: Prepare a charcoal barbecue using a chimney starter or gas grill for indirect grilling over medium heat; the temperature inside the grill should be about 350°F. If using charcoal, bank the lit coals on either side of the grill bed, leaving a strip in the center without heat, and place a drip pan in the center. If using gas, preheat the burners, then turn off 1 or more of the burners to create a cooler zone. Brush and oil the grill grate. Place the chicken pieces on the grill over the direct-heat area and sear, turning once, for 2 minutes on each side. Move the chicken to the indirect-heat area, cover the grill, and cook for 30 minutes. Now, start brushing the chicken with the BBQ sauce, turning and brushing the pieces every 5 minutes, for about 15 minutes longer. The chicken is ready when it is firm to the touch and the juices run clear when a thigh or breast is pierced with the tip of a knife. Transfer the chicken pieces to a clean platter and serve at once. Pass the remaining sauce at the table. Because the chicken is mostly cooked through when you start basting with the sauce, it is OK to serve the extra sauce at the table. To be extra careful, it is always a smart idea to bring the extra sauce to a boil before serving. Make the Herb Mop: In a bowl, whisk together the canola oil, tamari, vinegar, lemon juice, Worcestershire, garlic, mustard, parsley, rosemary, oregano, thyme, 1 tsp salt, and 1 tsp pepper, mixing well. Use right away or store in an airtight container in the refrigerator for up to 6 weeks. Shake or whisk well before using. It can also be used as a marinade. Makes about 2 cups. Prepare the Chicken: At least 30 minutes before you are ready to begin grilling, remove the chicken from the refrigerator. Rinse and pat the chicken dry with paper towels, then season inside and out with salt and pepper. Slip the rosemary sprigs into the cavity, and then tie the legs together with kitchen string. Set aside about 1/4 cup of the herb mop for serving. Prepare a charcoal barbecue using a chimney starter or gas grill for indirect grilling over medium heat; the temperature inside the grill should be 350°F to 375°F. If using charcoal, bank the lit coals on either side of the grill bed, leaving a strip in the center without heat, and place a drip pan in the center. If using gas, preheat the burners, then turn off 1 or more of the burners to create a cooler zone. Brush and oil the grill grate. Place the chicken, breast-side up, over the indirect-heat area of the grill. Cook, turning and rotating the bird occasionally, and basting the bird about every 15 minutes with the Herb Mop, until nicely browned all over and an instant-read thermometer inserted into the thickest part of the thigh away from bone registers 165°F to 170°F, or the juices run clean when a thigh joint is pierced with the tip of a sharp knife. This will take 1 to 1-1/2 hours. Transfer the chicken to a cutting board, tent with aluminum foil, and let rest for 10 minutes. Cut into serving piece and arrange on a warmed platter. Pour a little of the reserved Herb Mop over the finished chicken, and pass the rest alongside. Serve at once. In a small container with a tight-fitting lid, stir together all the ingredients. Cover and shake vigorously to mix. Use right away, or store in a cool, dark place for up to 1 month. Great with lamb and chicken. In a bowl, combine all the ingredients. Use right away, or cover and refrigerate for up to 1 day before using. Goes great with beef, lamb, chicken, fish, and vegetables. In a saucepan, combine all the ingredients and place over medium-high heat. Bring to a boil. Reduce the heat to medium-low and simmer, stirring, until thickened, 10 to 12 minutes. Use right away or store in an airtight container in the refrigerator for up to 1 week. Goes great with beef, chicken, and vegetables. « Double-Chocolate Malted Milk Shakes and Chocolate Ice Cream for Chocolate Monday!